Discussion in 'Getting Started' started by Soulmann, Aug 10, 2018. Every time I update, I get back this error after I click on the 'close' button once the update has installed... any idea what is goin on? I would if you told me what Linux you were using Kidding @Soulmann - Aussie sense of humour. But as a Tip, where you type in your Thread title, perhaps include the Distro eg "Target Package Errors LM 18.3 Cinnamon" - you'll get more responses more quickly. Is that what you are using? I took a quick look at your Post from about 3 weeks ago. First up, despite the header on the popup, this is a Warning, not an error. If everything is working OK after the updates, you're good. But the warning may keep appearing so we can clean that up too. Are you using Google Chrome? And have you installed or reinstalled it recently? I am looking at us going into your Software Updates Manager, or perhaps Synaptic Package Manager, and pinning down the duplicate entry and deleting it. That's "ls" as in "list". Soulmann and atanere like this. Yes I use Google Chrome, but to the best of my knowledge I have not installed a new copy, just the usual updates from Linux. Soulmann, atanere and Rob like this. Back in your OP (OP= Original Post or Original Poster) at #1, the "error" warnings were multiple because the packages Linux was updating for your Chrome, which comprised binary AMD64, binary All, a locale file (set to Canada where I take it you are from), and an English file. One warning for each package, lucky it wasn't updating 60 packages, lol. Also, the numerals - you'll see there references to google-chrome.list:3, and google.list:1 - these are the lines in the respective files which are duplicate and generate the Warning. Compare that with the last Post you have provided us, and you can see it is that line starting with "deb" for Debian. So you want to get rid of one of either google.list or google-chrome.list. To actually get rid of the files in /etc - which is owned by Root, you either have to assume Root (sudo su), or else use sudo, I would suggest sudo. BUT (Wizard always has a but), without my knowing if either of those files is involved with dependencies related to other packages, I would be more inclined to either "save as" the file targetted for elimination, or else simply to comment out the offending duplicate line in one of them. Given you are in 'Serena' Cinnamon, your default File Manager is Nemo. So I would suggest opening Nemo and from File System, tunnel to /etc/apt/sources.list.d and check the date-time stamp on each of the two files and report them back here. If your configuration is displaying icons for folders and files, click the icon near top right for list details. The more recent of the two files is more likely to be "the offender", and then we can take that & place a # in front of the offending line, and the problem will resolve itself. See if you follow everything, and then let me know. This is what is in there.. I haven't done the rest of the steps yet. oops forgot to change dir..
OK Google.list is gone.. I did save a copy. Just did an update through update manager and no warning box! yayyyyy Thanks for all the help Chris... next I get to try and figure out why my browsers will not play Brightcove videos . Soulmann just a word to the wise - PPAs (Personal Package Archives) were an invention of Ubuntu, and are confined to Ubuntu and its derivatives and descendants, which includes Linux Mint, Peppermint, Linux Lite &c.
I have had experience with one of Jonathan Thomas's PPAs and found it to be clunky, so do take care when you go outside the realm of packages contained in the official Repositories of your Distro. In the case of Mint, it is Mint's Repos and Ubuntu's Repos, combined. Subject to your space considerations, you might want to become acquainted with Tony George's Timeshift. I have a Tute on it here. Timeshift is like Windows Restore but way better. You can take a snapshot of your system with it before you introduce foreign software, and then if anything goes pear-shaped, roll back your system to how it was. And to head off at the pass any questions on hypocrisy on my part (you can install Timeshift from a PPA) - Tony's product is so trusted it is now being shipped with certain Distros already installed. I have been using it for 4 years, and it has saved my bacon a number of times . Linux Mint started shipping it a little after yours. 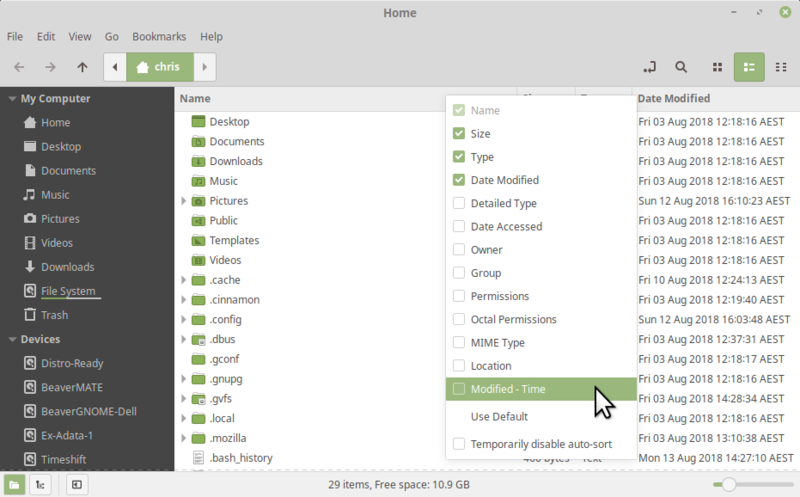 with the 18.3 'Sylvia' series, and it is now in Linux Lite 4.0 and also in Manjaro 'Strit', a community spin of Manjaro. More will likely follow. Any questions on Timeshift, feel free to ask over at the Tute. Thank you once again Chris! I downloaded it and ran it right away... took a while, but it's there now so I have some kind of backup.